عندما تزور هذه المدينة رائعة الجمال، ستشعر أنك في بيتك في Getaway on Grafton Apartments الذي يقدم لك إقامة متميزة و خدمات عظيمة. يجذب هذا العقار ذو 4.5 نجوم، والذي يبعد 1. Km فقط عن وسط المدينة و 7. Km عن المطار، الكثير من الزوار سنوياً. يضفي محيط الفندق اللطيف وقربه من أكثر المعالم السياحية جذبًا سحرًا خاصًا على هذا الفندق. يقدم Getaway on Grafton Apartments خدمات لا غبار عليها وكل أشكال اللياقة وحسن الضيافة اللازمة لإسعاد ضيوفه. إن تسجيل وصول/خروج سريع, تخزين الأمتعة, واي فاي في المناطق العامة, صف السيارات, غرفة عائلية هي جزء فقط من الخدمات التي تميز Getaway on Grafton Apartments عن باقي الفنادق في المدينة. تنعكس أجواء Getaway on Grafton Apartments في غرف الضيوف.تلفزيون بشاشة مسطحة, اتصال لاسلكي بالإنترنت, غرف لغير المدخنين, مكيف هواء, شرفة/ تراس هي بعض الميزات الموجود في العديد من الغرف. صممت خدمات الاستجمام في الفندق والتي تتضمن حمام سباحة خارجي, سبا, غرفة ألعاب لمساعدتك على الاسترخاء والراحة. إن Getaway on Grafton Apartments هو خيارك لخدمة الفنادق الراقية في المدينة. Location is great. Free parking. 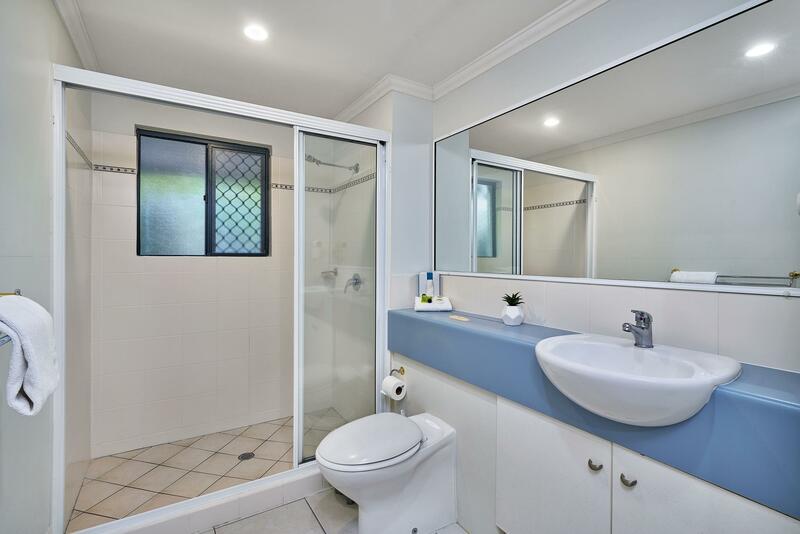 Big two level apartment, both rooms are ensuite and extra toilet on the first level. Easy check in and out. Only con maybe the blacket. It is quite smelly but we don’t need to use it anyway. 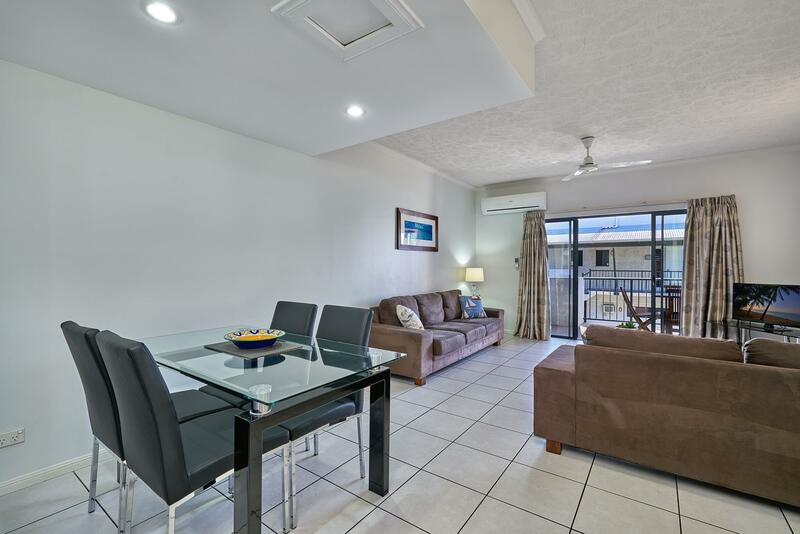 spacious, comfortable, close to the beach & shopping malls by few mins drive. We were welcomed at check in & had someone assist my elderly mum carry her bags up the stairs. The apartment was well equipped, very clean & spacious. The pool area is lovely although a little cold! It was a bit noisy during the night but the beds were very comfortable so sleeping wasn't really a problem. 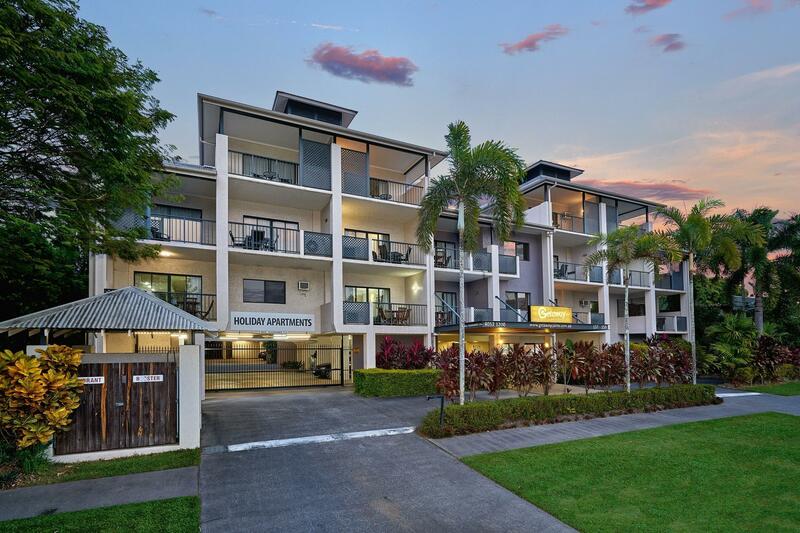 It felt like a home away from home and it is a great place to base yourself for a Cairns & TNQ holiday. The only small issue is the stairs if you have heavy suitcases or lots of groceries to carry (neither of which we had to worry about). Facilities very good. Car parking good. Location convenient to get around. Very happy with apartment and office service and staff. Staff were friendly and knowledgeable about places to visit. The apartment was clean and had everything we needed. 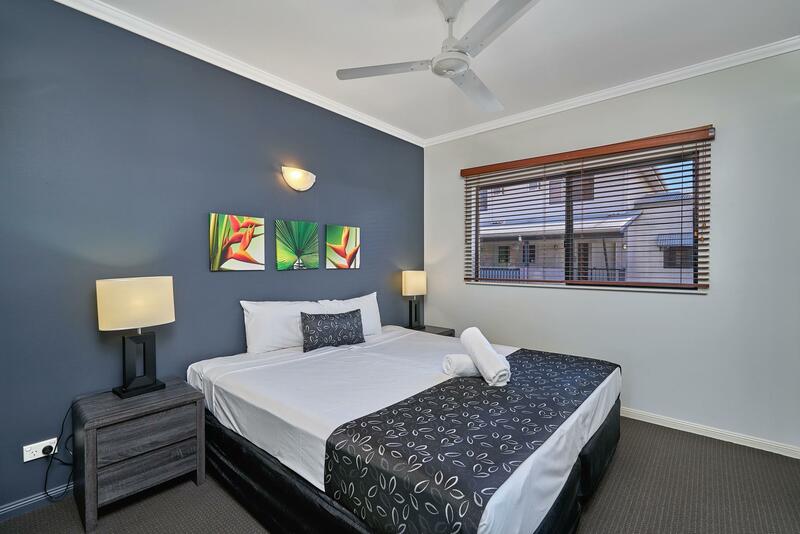 staff is really helpful and the service is really good; location is not bad, 10 mins walking to shopping centre and 15 mins walking to CBD, room is clean but the furnitures are bit old, especially the wardrobe, not sure why, the wardrobe keep making noise , and the noise is really loud in the night. Our stay was disappointing. I write my review based on over 20 years in hospitality, working in 5 star establishments and having achieved a Swiss Diploma in Hotel Management. When we arrived the room was dirty - dust on the ceiling, hair in the bathroom, sand and dirt between the couch seat and under the glass table, bird droppings on both balconies and outside furniture, gouges in the lounge walls and chipped glasses to drink from. Then I had to remake all the beds as housekeeping have a unique method to sheet placement and tucking in. Next, Reception failed to resolve, if they looked at all, problems we had with our tv and remote. If staying please remember to bring dishwashing detergent, soap, garbage bags, beach towels, clothes washing powder and cleaning clothes - Reception are happy to charge you for any and all. Remember to take your own garbage to the skip bin as they cannot and when checking out leave nothing or expect a $55.00 rubbish removal charge. The establishment is tired and although has received accolades in the past couple of years it is a far cry from its former grandeur and unfortunately whoever attained these accolades must no longer work their. They need to revise their tariff and bring it more in line with reality of building. The building has much potential and with maintenance and proper cleaning could return to its former glory. The positives we found were: Security, location and parking. The rest was a disappointment so shame on you Getaway on Grafton. We were really pleased with the accommodation at Getaway on Grafton. Thought it was great value for money and the owner / manager was really helpful in booking our trip to the reef and recommending places to go and eat. The only thing I could find fault with was that the dishwasher smelt a bit as it hadn't been used for a while. Not sure the taxi drive's problem or not, we can find the hotel when arrived. We lived in G/F (which is not what we requested) but the room is large and clean. Furniture are a bit old. You can walk to the supermarket but a bit far from City Centre (around 15 mins walk) Staffs are nice and helpful, they assisted us a lot during the stay. A very positive experience at an affordable rate.